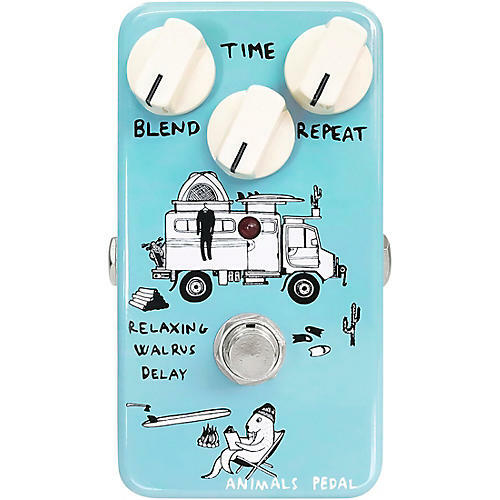 The Animals Pedal Relaxing Walrus Delay is a vintage-voiced analog delay, and is said to evoke the Yamabiko Effect, the mystical and spiritual effect of echo found in the mountains of Japan. Featuring delay times ranging from 1ms up to 1250ms, a Blend control for mixing your wet and dry signals, and Repeats adjustment to control the echoes, Relaxing Walrus offers more than enough flexibility to satisfy any type of player. There’s also an internal trimpot which provides adjustment to fine tune the self-oscillation, furthering the options and uses of this small and bold effect. All Animals pedals feature artwork by Jonas Claesson, operate on 9v power, feature true-bypass switching, and are made to exacting standards of performance and durability using only the highest quality parts and materials.